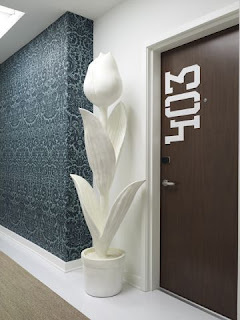 Home design Honkin’ big tulip! OK, now that’s what I would like to have greet me everyday when I go in my apartment. Or office. Or just anywhere! I am inspired. That blog does the trick every time. And remember, if you can’t swing a tulip this big, call your LOCAL florist for your tulips. Mothers Day week is here. Don’t forget your mamma!